Anyone who has made a habit of reading Stylin' Mamma over the years knows I love me a statement necklace. Everyone talks about how handbags and shoes are fun to shop for because they never make you feel fat, and I am going to go ahead and boldly throw statement necklaces into that category. 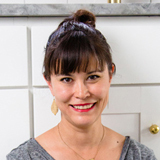 A lot of the other bloggers I read make a daily habit of wearing dainty little chains with dainty little charms, and that's fine; I myself am probably most often spotted in the Elsa Peretti Tiffany heart my husband gave me on our wedding day. But anytime -- and I mean ANY. TIME. 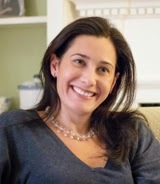 -- I'm staring into the closet thinking what to wear, what to wear I invariably turn to that no-fail combo of jeans, tee, flats, and statement necklace. There is nothing simpler. This month, as the winter doldrums set in and the resort collections taunt you, brighten your day (and your outfit) with one of these seven-best beauties. streamlined disco / for the dreamer / blooms! / utterly chic / simply boho / geometric / neon! 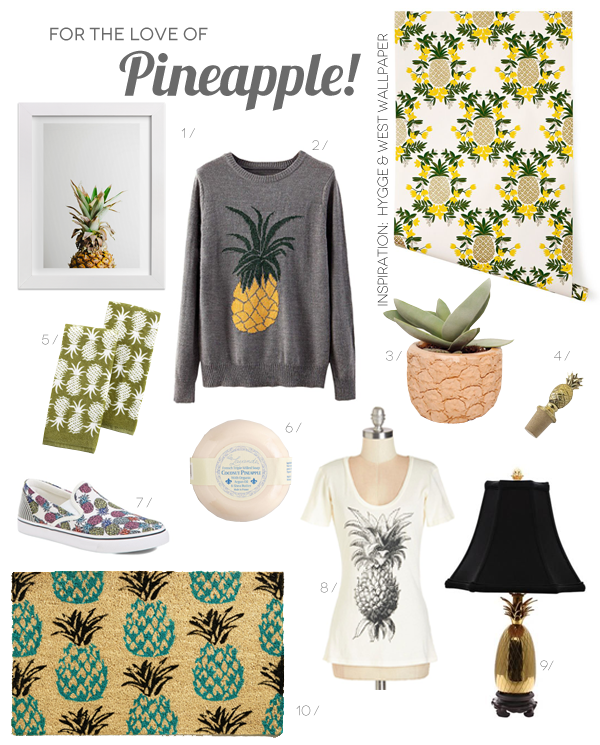 Unless you've been in a cave, I'm sure you've seen everyone's latest obsession... the pineapple. It can be found everywhere, from fashion to wine stoppers. Believe it or not, there are some stylish pieces out there and it doesn't all look like it belongs in the tropics... Check it out. Its Jessica Burne here. 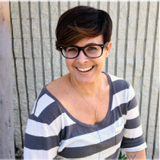 I’ m so excited to be part of the Nest Studio team. 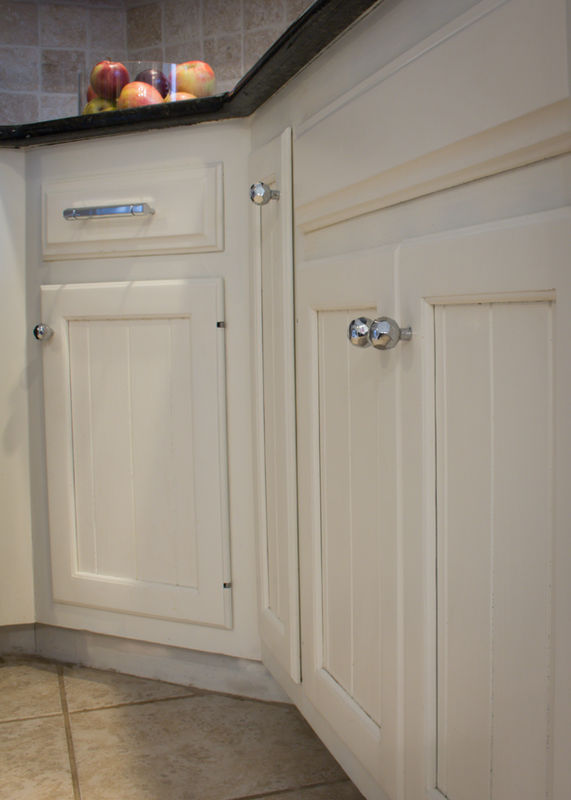 In the spirt of the New Year, I thought it would be fun to show you my “new” DIY kitchen. 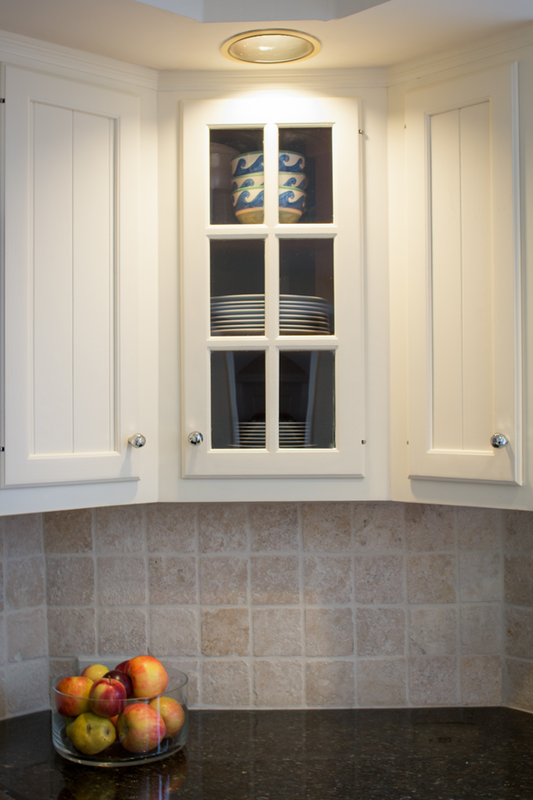 When we first moved into our house ten years ago we immediately updated the appliances and countertops, but there just wasn’t room in our budget for new cabinetry. 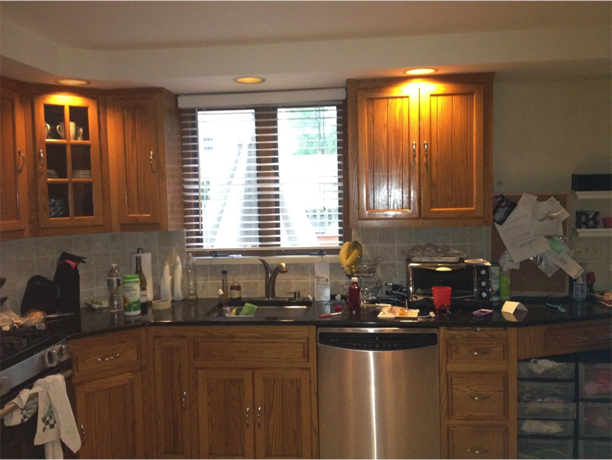 So we were stuck with 80’s golden (technically orange) oak cabinets - beautiful right? Here is a snapshot of the before. I’m not sure what possessed me to take this photo when the counters were so cluttered. Let’s call it a lived-in look. Fast forward a few years, I decided nothing could be worse. So I took the plunge and refinished the cabinets myself. 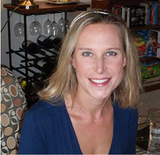 I won’t go through all the gory details of my process because there is a ton of information online. I found Evolution of Style’s tutorial to be particularly helpful. Armed with a paint sprayer and gallons of paint, I successfully completed the project all by myself. I do have to give a special shout out to my super talented dad who was able to build a matching cabinet that replaced an old in-wall air conditioning unit. Without further ado, here is the result. If I do say so myself, I think the transformation is incredible. Our kitchen looks bigger, brighter and more modern. 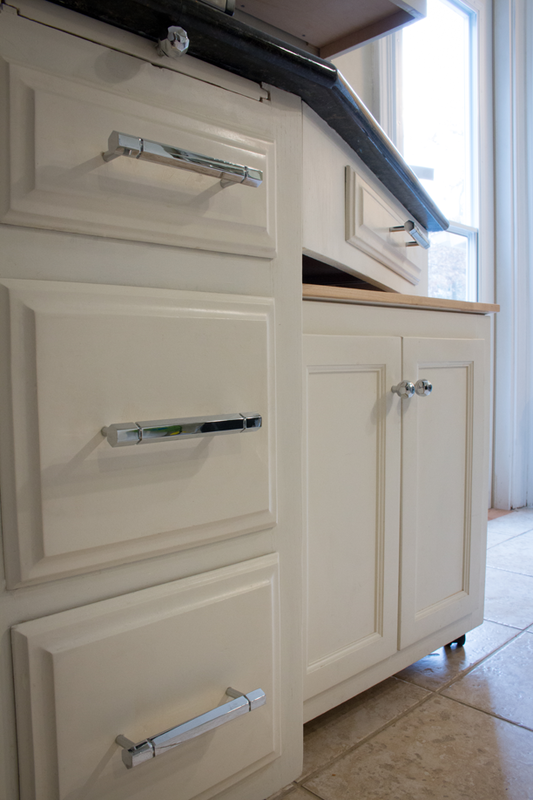 The combination of the chrome pulls and handles bring the whole look together. 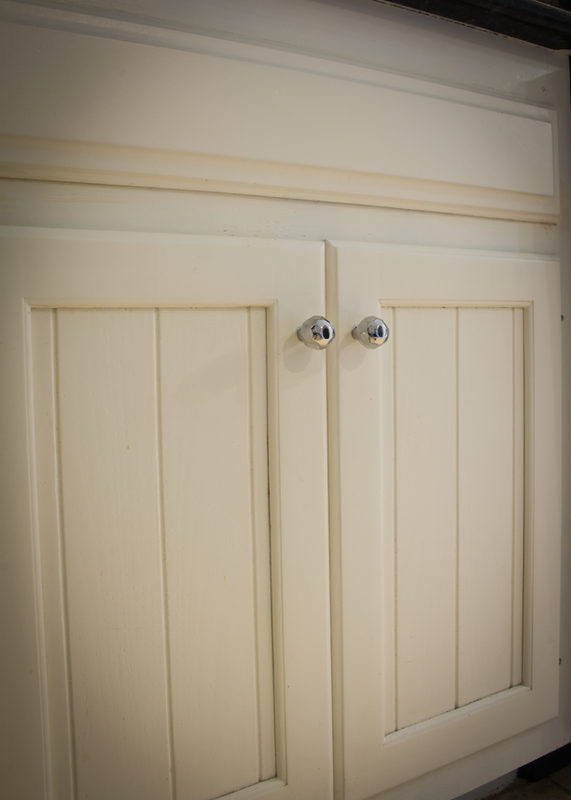 It’s amazing how a few coats paint and updated hardware can make such an impact. Do you have any examples of “before and after’s” that include Nest Studio hardware? Big or small projects, we would love to see your photos! With an 8 month old and a 3 year old and all their accompanying toys and gear, our house is starting to feel a little cramped. Add a hardware business, employee, and part-time nanny to the mix and it is really starting to feel like we are all on top of each other. Our house is arranged as follows: On the main floor, we have our living, dining, kitchen and powder rooms. 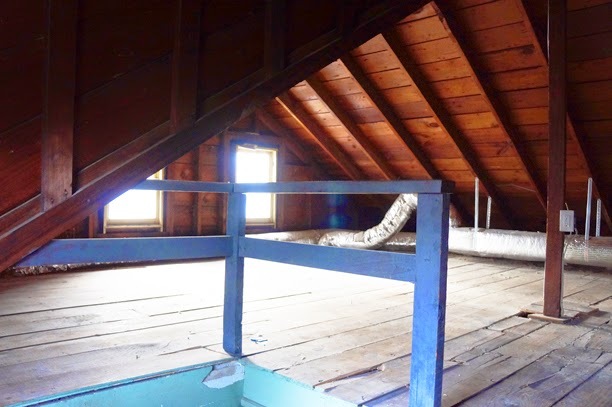 Upstairs are three bedrooms and a bath. We have a play room, office, guest room and guest bath in the basement. It sounds like a lot of space, but our house is more like a large cottage proportion wise. My hardware is overflowing into our play space and I'm constantly worried that my employee Jessica will trip over Bryan's trains and play kitchen food (that would make for an interesting workers comp claim). I also wish that we had an entryway / mud room and a family room space on the main floor - but more on that later. 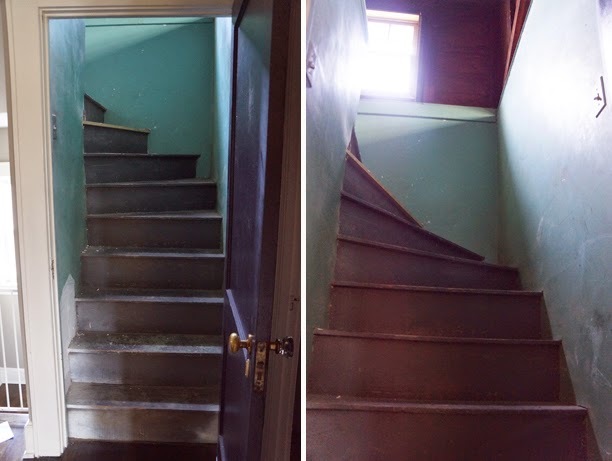 We are lucky to have a walk-up attic though. 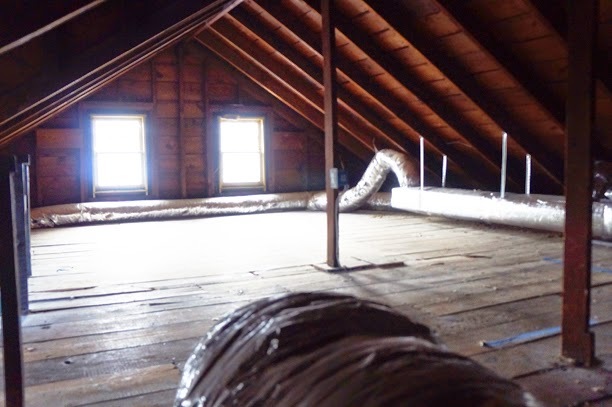 When we first moved in we had visions of turning the attic into a master suite with a bath and closets. But we really don't need more bedrooms and quite honestly a master suite build-out would require bumping up the roof (and re-roofing the house) and creating a bath which is a pretty significant chunk of change. What we really need is to separate the play space from my ever-expanding office area. 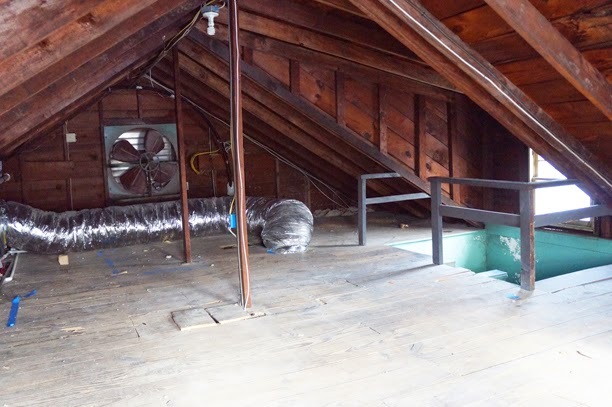 So we are beginning a project in the next couple weeks to finish out the attic and turn it into a play room. 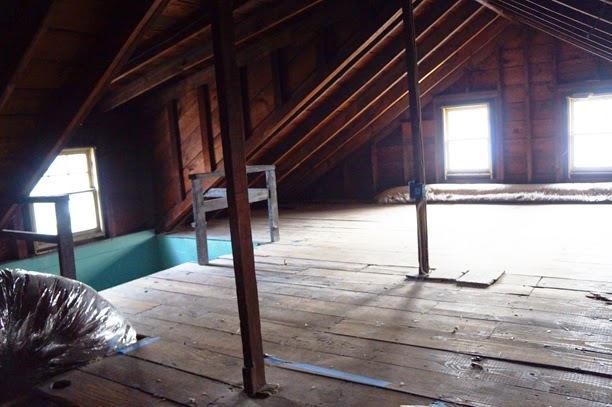 We will frame out a bathroom area so that a future owner could add a master bath if they wanted and that actually allows us to use that space as storage (since we had a bunch of stuff up there before that we would like to store). The duct work below the windows will be framed out to make a fun window seat area. The space will have a nice tree-house feel and it will be carpeted which will be great for the wee ones (usually I'm not a fan of carpet but it is certainly most economical). I present to you the space as it is now. 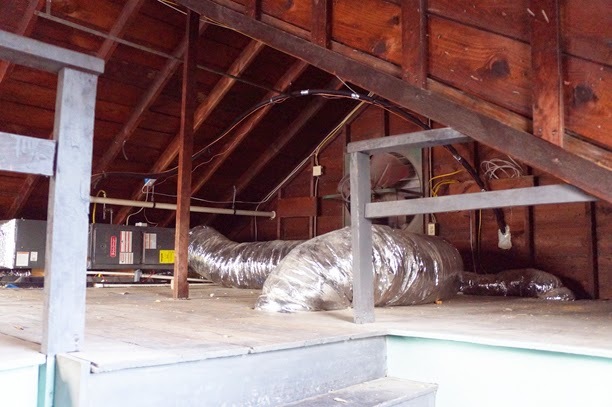 Aside from the attic, we plan to do more planting this year and maybe dress up the guest room a tad. 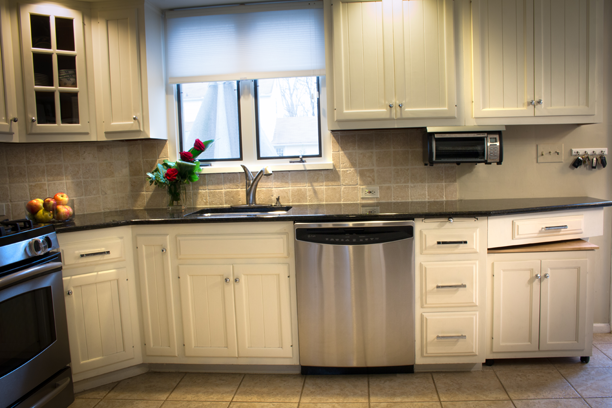 What home improvements do you have slated for 2015? 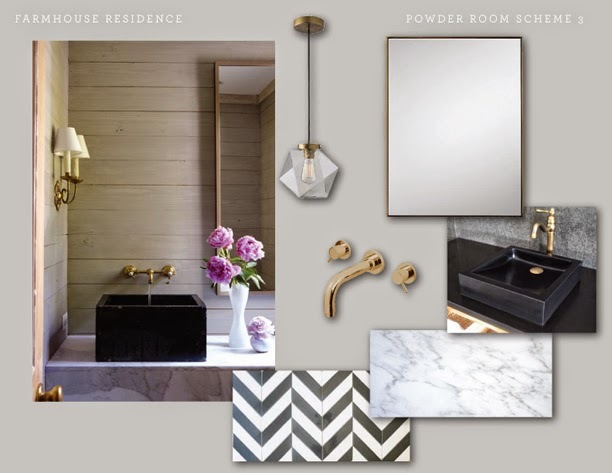 We've been doing a little press scouring recently in preparation for some promotions for the hardware line and came across Evolve Residential's design board for Boston Magazine's summer design issue that includes our F-02 knob in Satin Brass. 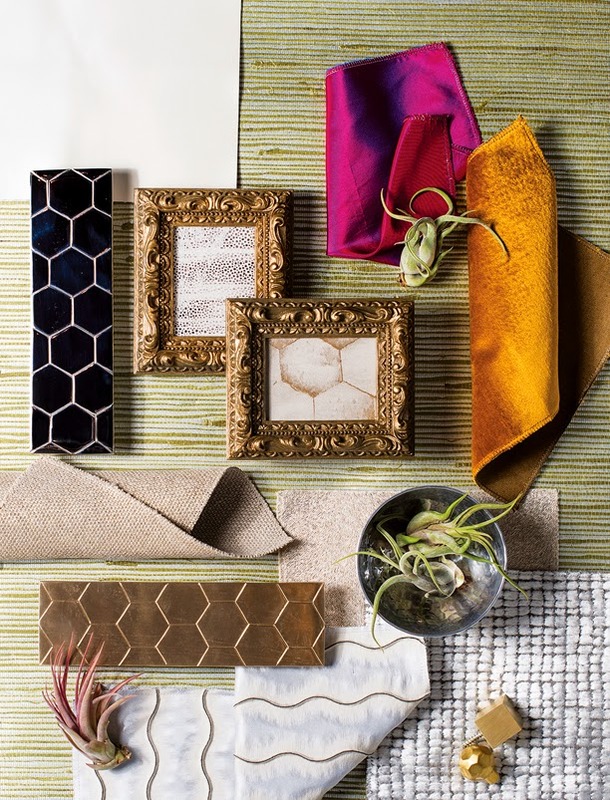 Love the rich color palette and glamorous yet textural material play. Have you featured our hardware on your blog,website, or design board? Send us a link or image and we will feature it here! Every once in a while I come across a room that makes me not hate "beige". 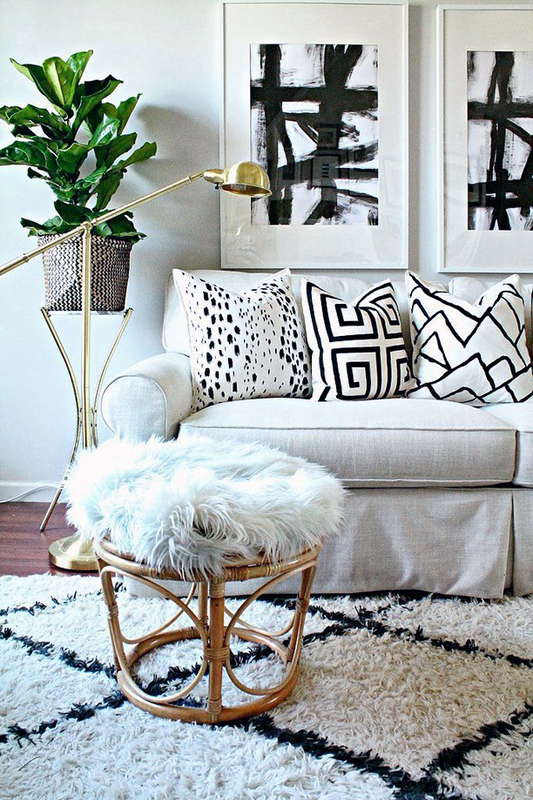 The amount of black details and graphic patterns in this space balance out the otherwise boring nature of a beige living room. Hi Everyone. A bit late, I know, but wanted to share with you our hardware featured on super star fashion blogger Chriselle's blog. 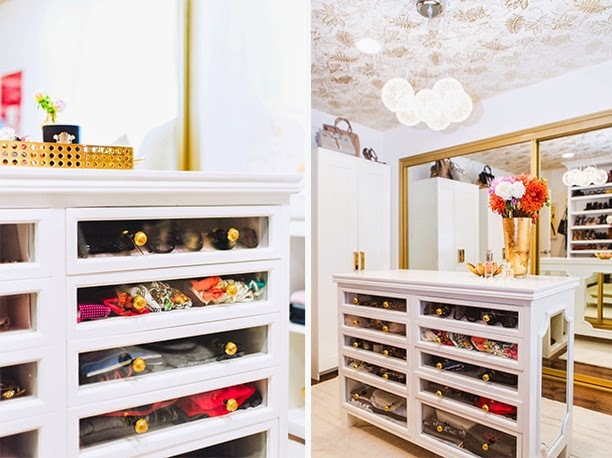 LA Closet Design CEO Lisa Adams worked with Chriselle to do a revamp of her closet this past fall. 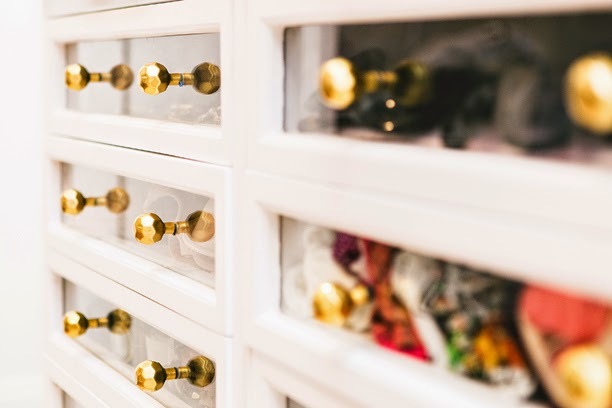 They used our Facet 02 knob in satin brass on her clear drawer fronts. I'm sure all of you are drooling over this closet as I am. 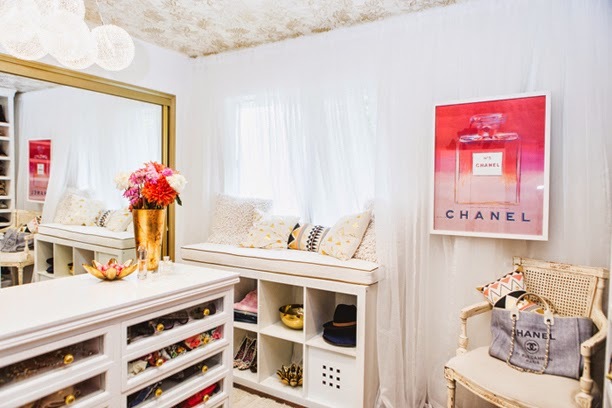 I think I'm going to have commandeer Bryan's bedroom so I can create my own lady lounge wardrobe oasis of similar magnitude (he should do just fine sleeping in the bathtub right?). Of course, then I will have to up my style ante and buy a bunch of designer clothes (more on that later). In the meantime, I present you with the below eye candy. 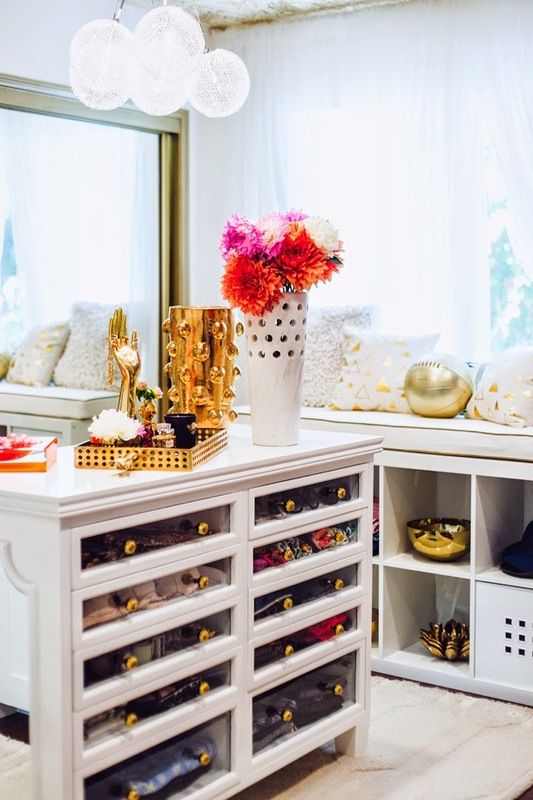 Thanks to Chriselle and Lisa for featuring our hardware in such a beautiful space. In honor of the presenters with the least chemistry at the recent Golden Globe Awards, who will soon star in a much anticipated film based on the popular book... 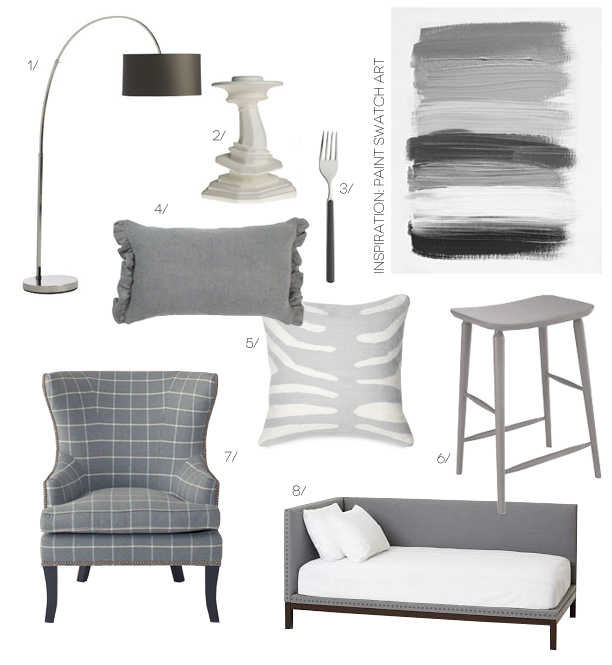 I bring you Shades of Grey, for the home. As we enter a new year, I thought we would take a look at this beautifully designed foyer. 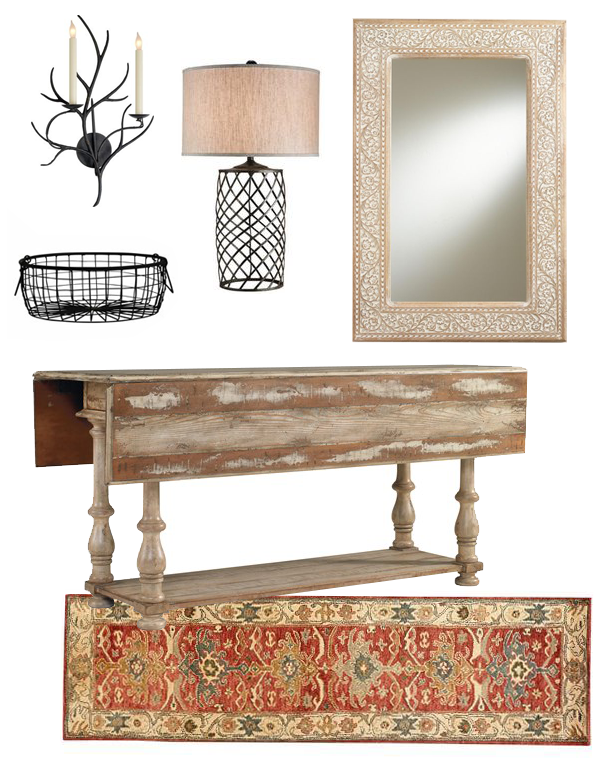 This entryway from House Beautiful is a pretty balance between modern and country style living. It's clean and uncluttered, but the materials and textures lend a rustic vibe. Want this look...? OK guys - I'm almost done showing you bathroom concept boards. Are you tired of them yet? So far you've seen the Urban Farmhouse kitchen, master bath, kids' bath, and guest bath. 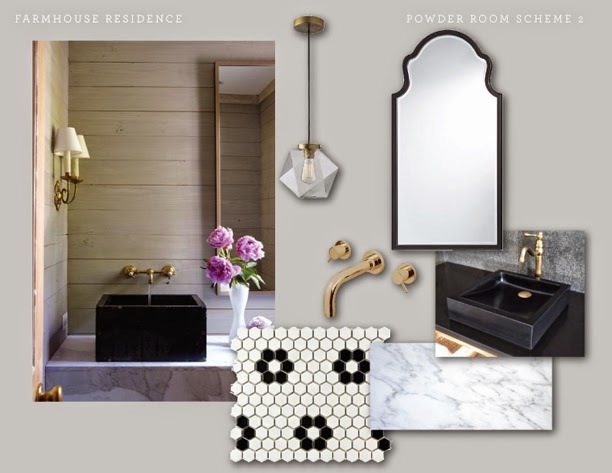 Now on to the powder room. This is a more public room used by both the residents and guests, so I figured we could go for more impact and something funky in here. Option 2 is more modern. I used the shiplap board paneling in here again and used a stone vessel sink with brass wall-mounted plumbing. The faceted pendant plays off the hex floor tile and a more feminine mirror contrasts all the hard lines. The final option that my clients chose, Option 3, once again is a hybrid of the first two. They finally said yes to the paneling (hurrah!) 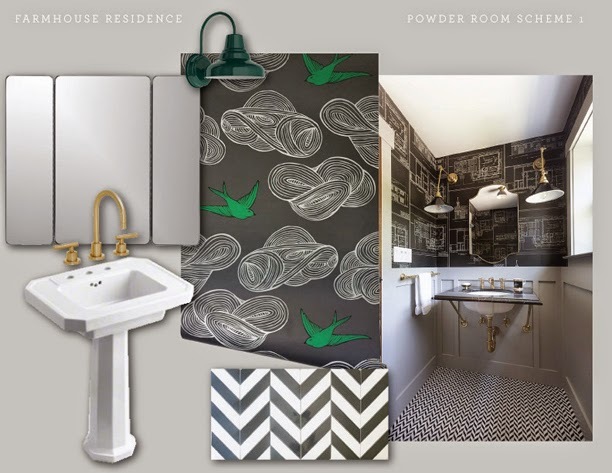 and the stone vessel sink, but they loved the chevron floor from Option 2. 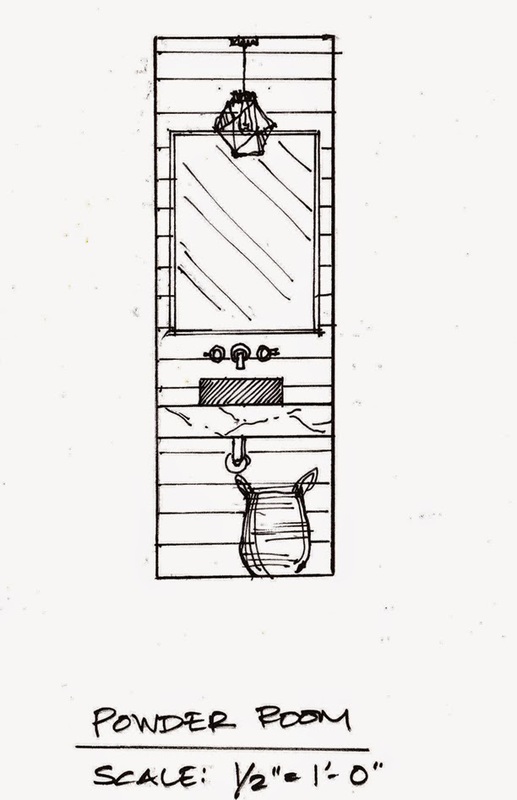 We had to switch out the mirror to a more clean lined one (like the concept image) because the feminine one was too tall for the space with the wall mounted fixtures. What do you think of the Urban Farmhouse so far? 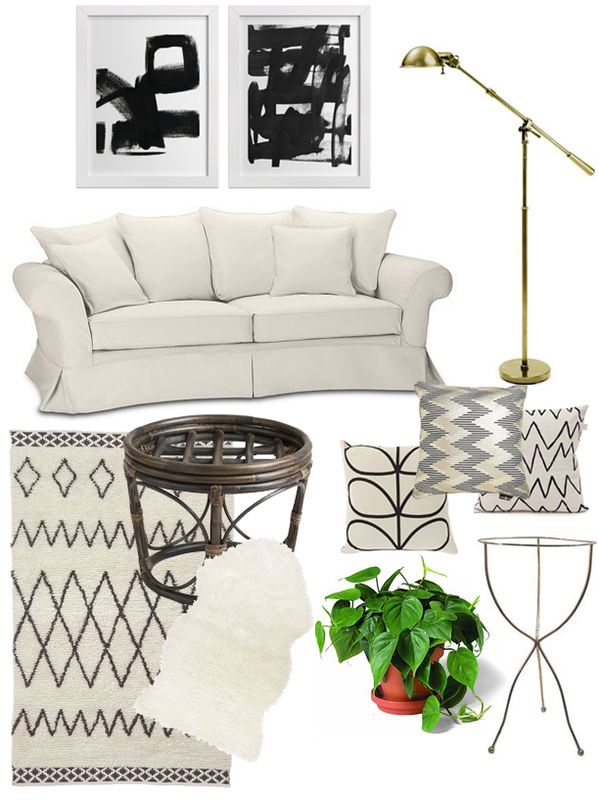 I can't wait to show you the softgoods and decor schemes as we move forward!